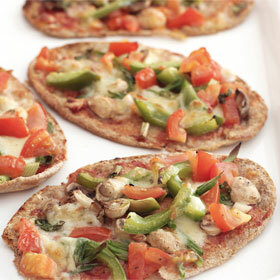 Pitta breads make a quick and light pizza-style base which goes crispy in the oven. Topped with a selection of fresh vegetables, they make a filling, wholesome lunchtime snack. You can choose whichever vegetables you like best, such as artichokes or sweetcorn. 1 Preheat the oven to 200°C/400°F/Gas 6. Split the pitta breads in half and put them on two heavy baking sheets. Spread each half with a teaspoon of ketchup and add a little garlic, if using, and divide the pepper, mushrooms and spring onions between them. 2 Season to taste and top with chunks of torn Mozzarella, then pieces of tomato and half the basil leaves, torn. 3 Cook for 20–23 minutes, changing the trays round in the oven half way through cooking. Serve two ‘pizzas’ per person garnished with basil and accompanied by lots of green salad. If you do not have pitta breads then try this recipe using a wholewheat French stick, halved. It may take less time to cook so check from time to time.